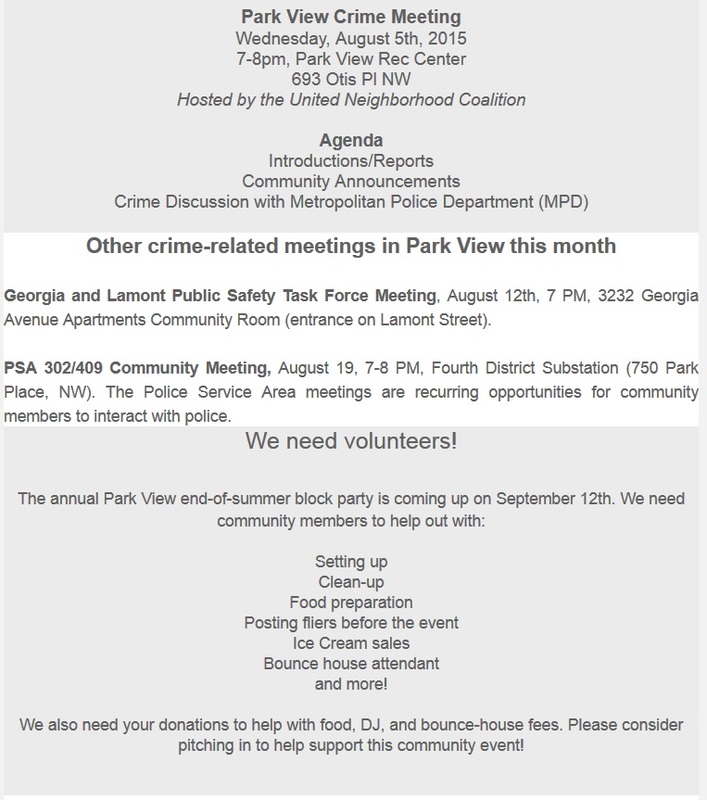 crime prevention | Park View, D.C.
Public Safety is something I take very seriously, and while much of the work I do is directly with MPD and individual neighbors, there are times when a more public approach needs to be taken if we truly want to have safe communities. A recent effort that I would encourage neighbors to participate in is with the Park View UNC which held a public safety working group meeting on Saturday August 26th. At this meeting neighbors began listing the public safety challenges that our community faces and started the process of identifying which agencies (i.e. MPD, DCRA, DOH, DDOT, etc.) would need to be included to successfully address the community’s challenges. As an active participant in the meeting, I can report that it was one of the most productive meetings I have attended in some time. 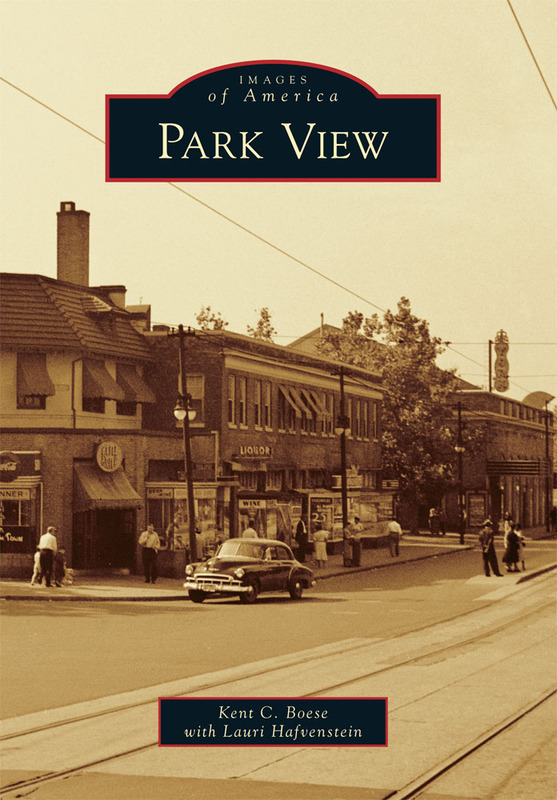 The next Park View UNC meeting will be at the rec center on Wednesday, September 6th, at 7 pm. I do believe there is a lot neighbors can do to make their communities safer, especially if their elected representatives are working with them, supporting them, and helping to coordinate with all the people that are needed to solve the problems — both in the short- and long-term. 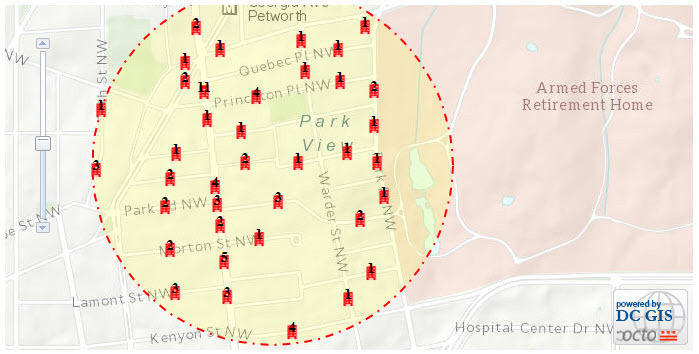 With all of this in mind, I regularly walk the neighborhood to report problems and look at the DC Crime Map to understand what the official statistics tell us about our community. Its a good way to report issues proactively and keep an eye on problem properties. 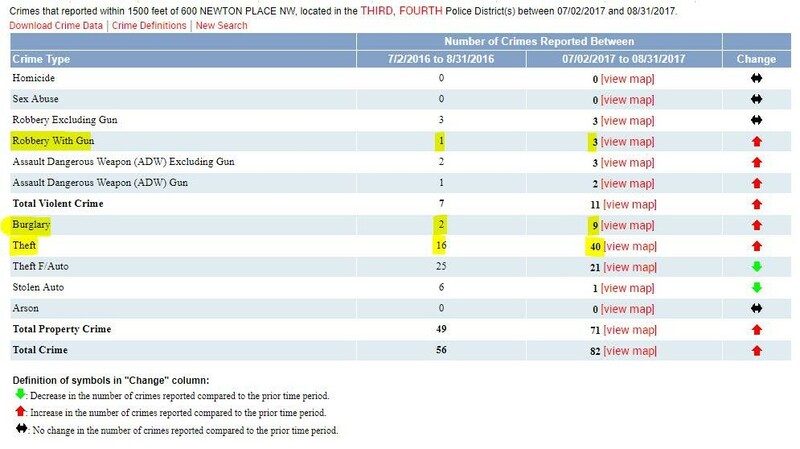 In Park View, some of our challenges include vacant properties, entrenched drug dealing, and being split between the Third and Fourth Police Districts. Because of the latter I generally choose the location of 6th and Newton Place as an area close enough to the neighborhood boundaries to give me an idea of crime trends when using the Crime Map. Anyone can use the Crime Map to fine tune the data to their particular address. Does our neighborhood have the number of beat patrol officers needed? How does the neighborhood being in two police districts impact the overall service? For deeply rooted social issues, do the behavior health people have the staff, resources, and authority to address addiction and homelessness issues? If not, will they ever? In my opinion, the answer to these questions is an overall “No.” I believe PSA 409 could use more beat officers, the entire neighborhood should be in one Police District, and I would like to see a stronger relationship between our plain clothes officers and the community. Lastly, while I value the work of our government partners who focus on the social challenges in our neighborhoods, I don’t believe they are staffed at the levels they need or that they have the authority they need to really solve deep rooted problems. I’ve included the chart below showing the crime stats for the last two months compared to the same period last year highlighting the areas with the largest jumps — those being robbery with gun, burglary, and theft. I’ve also included the map on where the incidents were recorded. CCTV security camera for home protection & surveillance. Earlier this year, The Private Security Camera Incentive Program, administered by the Office of Victim Services and Justice Grants (Office), was established and went into effect. 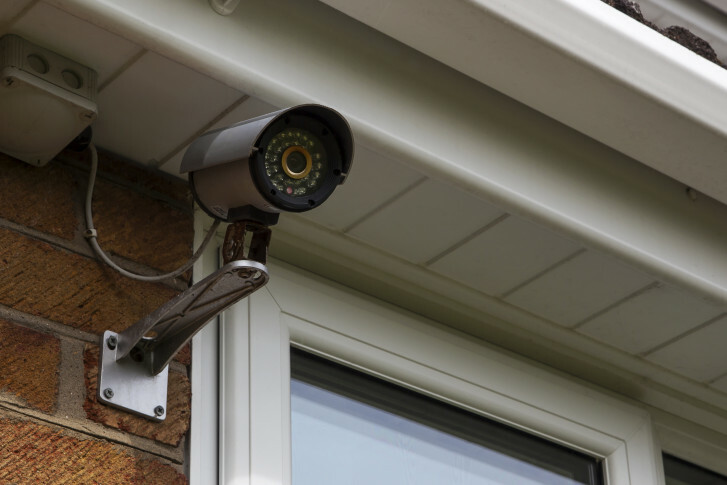 The Program creates a rebate for residents, businesses, nonprofits, and religious institutions to purchase and install security camera systems on their property and register them with the Metropolitan Police Department (MPD). The program provides a rebate of up to $200 per camera, with a maximum rebate of up to $500 per residential address and $750 for all other addresses. This program is intended to help deter crime and assist law enforcement with investigations (more details here). If you purchased a security camera after September 22, 2015 , live in the Park View neighborhood, and register your camera with MPD you are eligible for a rebate. The rebate form is located here. The Office of Victim Services and Justice Grants will give priority consideration to properties, businesses, and religious institutions in the following Police Service Areas (PSA):104, 105, 107, 108, 202, 207, 208, 302, 303, 305, 402, 403, 405, 409, all PSAs in the Fifth Police District, 602, 603, 604, 608, and all PSAs in the Seventh Police District. 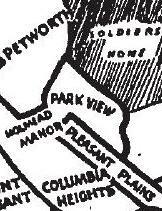 The good news for those in the Park View area is that the entire neighborhood is in PSA 302 and 409, both of which are priority areas. Here are the basics (FAQs here). Who is eligible? How much are the rebates? How much is the total funding available? National Night Out is an annual event held on the first Tuesday in August that involves a collaboration of police departments around the nation and local community members. Various law enforcement, government agencies, non-profit organization, and community stakeholders will be present to share strategies for problem solving while social service providers share information; all while having good family fun. It is a night to celebrate community pride, unity, and most importantly public safety partnerships. In the Park View area, the nearest event will be held at Bruce Monroe Park. This is one of several good opportunities to get to know our police officers better, especially with the growing need to focus on issues occurring on Georgia Avenue and throughout the neighborhood. On Saturday, March 21, Neighborhood Watch Trainer Samantha Nolan conducted a Neighborhood Watch session at the Bernice Fonteneau Senior Wellness Center located at 3531 Georgia Avenue. The training began at 10:00 a.m. and ran for about an hour and a half. The purpose of the session was to inform residents on how to prevent crime and reduce the likelihood of becoming a crime victim. More than 80% of crime in D.C. is preventable. By reducing the number of preventable crimes, the police can concentrate on preventing and solving more violent crimes. There were about 22 residents in attendance, and Ms. Nolan was excellent. She spoke about various types of crime and showed illustrations on what made particular houses or behaviors attractive to criminals. Related to Neighborhood Watch, MPD has a two page flyer with tips to prevent crimes of opportunity, which you can read here. One of the most important actions residents can do to reduce crime is to get to know each other. By having block captains and strong community engagement where residents look out for each other, many crimes of opportunity can be prevented or solved. Crime, and its prevention, is something that is of great concern to everyone in the community. I’m happy to report that I’ve help coordinate a Neighborhood Watch Crime Prevention Training that will be conducted this Saturday, March 21, 2015 at 3531 Georgia Avenue NW (Bernice Fonteneau Senior Wellness Center) beginning at 10:00 am. This is a free training open to anyone interested in reducing crime. Coffee and donuts will be served. If you want to learn ways to prevent crime and reduce your likelihood of becoming a crime victim, please attend the training. You will see pictures of actual crime scenes and learn how changing simple behaviors can reduce your possibility of becoming a victim of the crimes. More than 80% of crime in DC is preventable (Crime of Opportunity). By reducing these crimes, the police can concentrate on preventing and solving more violent crimes. The training will be conducted by Samantha Nolan, Citywide Neighborhood Watch Trainer.